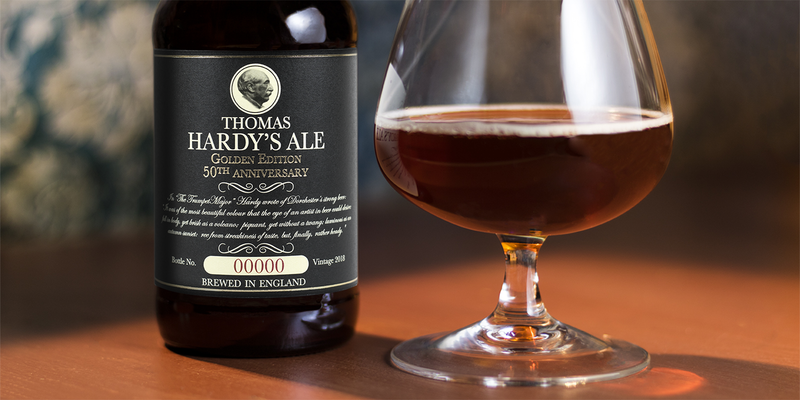 Thomas Hardy’s Ale is back home in the UK: the Barley Wine par excellence is finally available on the English market, exactly in the year of the 50th anniversary… celebrated with a special vintage, the “Golden Edition”, available on www.laithwaites.co.uk. 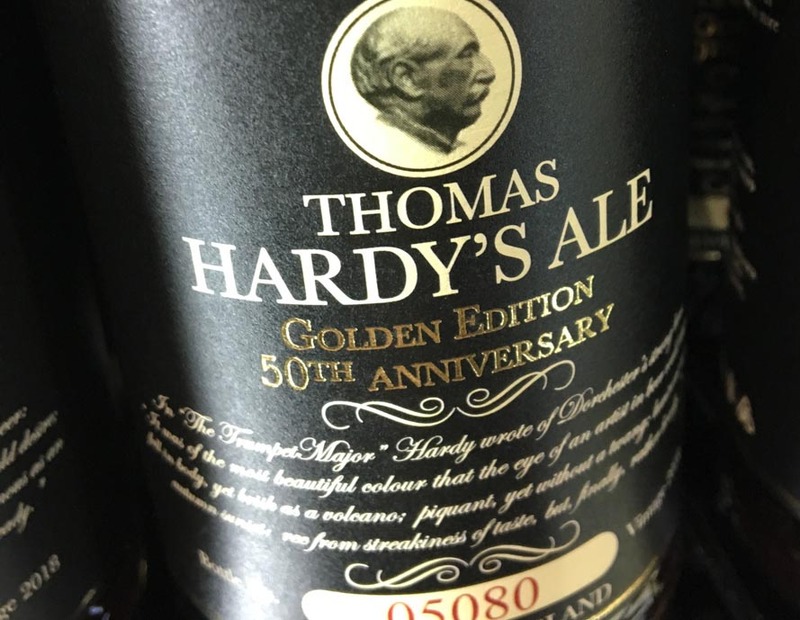 Fifty years later, the reborn Thomas Hardy’s Ale, produced by the brewmaster Derek Prentice at the Meantime’s London facility, is finally available on the English market thanks to the collaboration with Laithwaite’s Wine. And it happens precisely with the “Golden Edition”. Black label with golden details, the Thomas Hardy’s Ale vintage 2018 keeps its characteristics unaltered: limited edition, numbered labels and predisposition to aging in the cellar for many, many years. Only the alcohol content varies slightly and reaches an impressive 13% by volume. The 2017 vintage of Thomas Hardy’s Ale “The Historical”, matured in Tennessee Whiskey barrels, is being introduced at the international HoReCa Expo trade fair hosted in Ghent, Belgium. 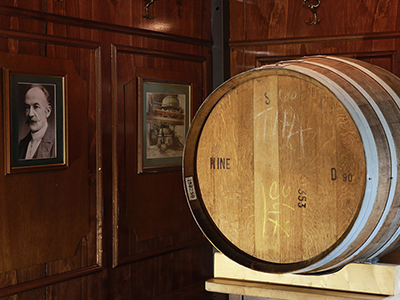 An opportunity to taste this year’s vintage directly from the barrel. 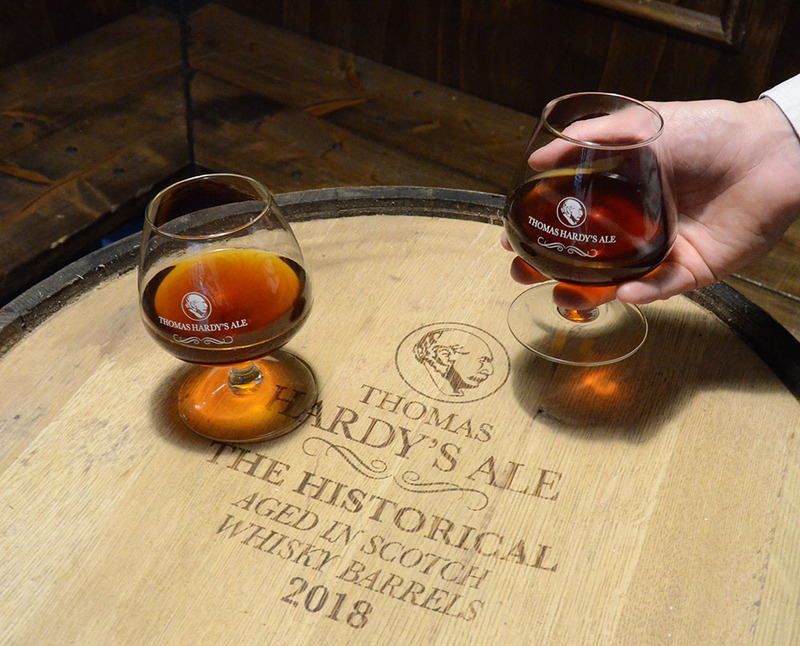 Participants at the international HoReCa Expo in Ghent, Belgium, can stop at the Thomas Hardy’s Ale booth and taste the new vintage of “The Historical” from the barrel prior to the launch on the market of the traditional 25 cl bottles. 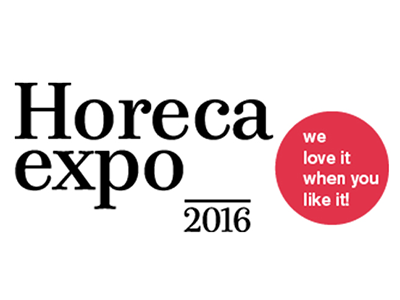 The HoReCa Expo is one of the most prestigious international Food & Beverage events in the world. Last year it hosted the introduction of the 2016 vintage of “The Historical” which had been matured in Hine Cognac barrels. This particular beer was a sensational triumph and the few thousand bottles produced in a limited edition literally flew of the shelves. The 2017 vintage of Thomas Hardy’s Ale “The Historical” was developed with the same production method as last year’s. 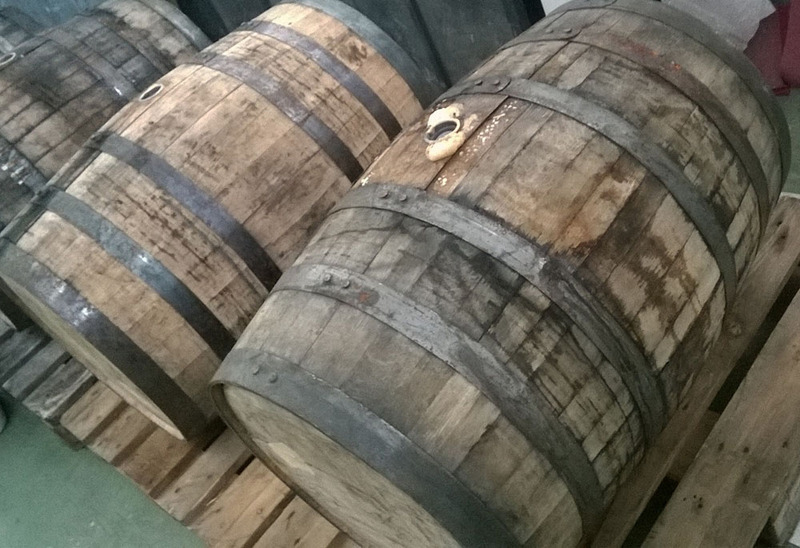 It matured in barrels for six months. The difference being that this year, instead of maturing in Cognac barrels, “The Historical” was matured in Tennessee Whiskey barrels. In twenty-five 250 litre barrels, to be exact. Doing the math is pretty easy here: a few thousand bottles were produced this year as well. As always, they have been numbered and vintage-dated and released in a single edition. They will most definitely be a sell-out as well and will enhance the cellars of Barley Wine aficionados who will have to wait patiently as they let the bottles refine – as dictated by tradition. Any description runs the risk of being too trivial: the complexity of the bouquet resulting from the American Whiskey is impactful and makes one want to hold the beverage in a balloon glass for a few minutes and relish its woody, toasted and refined aroma before tasting it. The warm and full-bodied taste is endowed with a palate in constant evolution and a decidedly persistent aftertaste. The alcohol content is altogether distinguishable; there are no other alternatives since its ABV is almost at 13% and yet its drinkability is in no way hindered. The appointment for those working in the industry is from 19 to 23 November at the International HoReCa Expo in Ghent at Hall 6 – Booth # 6105. Bottles will be placed on the market at a later date so keep your eyes open and make some room in your cellar. 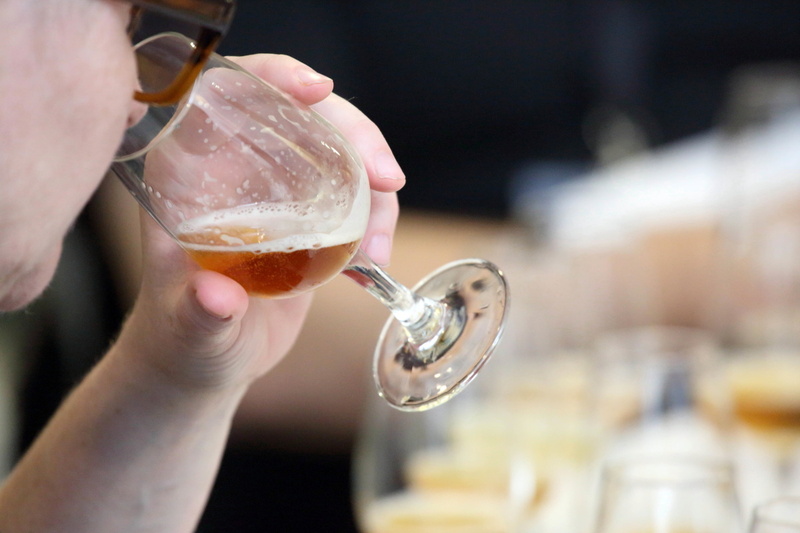 New York State is the first to welcome Thomas Hardy’s Ale back to the US: the famous English Barley Wine, the finest in the UK according to the jury of the World Beer Awards, is being introduced in America with its Vintage 2017 for a special world preview. If there is any truth to the saying that winning is difficult but winning again is even more difficult, then the medal Thomas Hardy’s Ale won at the 2017 World Beer Awards is even more prestigious as it takes its place on the international brewer master scene. First of all, because winning the title of “Country Winner” (the UK’s best Barley Wine) two years in a row is no easy feat. A traditional style founded and confirmed right in England makes competition in this category of the highest level. This recognition is also a significant validation of the new work team led by the renowned English brew master Derek Prentice who has been capable of interpreting the recipe in the best way possible and re-establishing an authentic icon in the world of beers. An icon that American aficionados can finally enjoy after almost a decade: the American distribution network is still in its start-up stage but the very first bottles of Thomas Hardy’s Ale are already on sale in New York and Maryland, while experts in the industry in other American states will have an opportunity to meet Thomas Hardy’s Ale staff members during the upcoming NBWA Annual Convention in Las Vegas at the MHW Ltd. Booth Number 841. 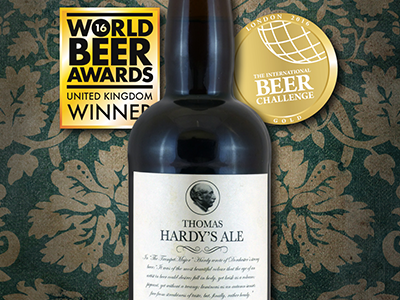 The World Beer Challenge awards the fourth gold medal to the re-born Thomas Hardy’s Ale, back in production since 2015 after 7 years. In Estoril, Portugal, it is actually a double win thanks to the silver medal awarded to The Historical Ale matured in Hine Cognac barrels. There is undoubtedly a big risk involved whenever a piece of history that could even be considered legendary is revived. The Vecchiato brothers were well aware of this when, in the summer of 2012, they finalised the acquisition of the brand and the recipe of the legendary Thomas Hardy’s Ale, produced from 1968 to 1999 by the Eldridge Pope Brewery and later from 2003 to 2008 by O’Hanlon’s. Three years to carefully study its history, locate a brewery that could reproduce it, fine-tune the recipe and finally Thomas Hardy’s Ale was ready to be produced and, in 2016, it was officially launched on the market. The difficult comparison with the vintages of the past is amplified by the fact that this Barley Wine par excellence improves over the years, making a “direct comparison” with more mature vintages misleading. 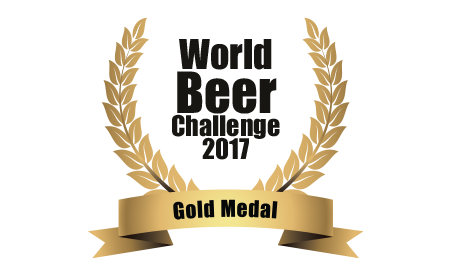 Nevertheless, the palates of the international judges immediately recognized the same mark as the original, awarding the “new” Thomas Hardy’s Ale three gold medals over the course of 2016, to which a fourth has now been added: that of the World Beer Challenge 2017, which awarded this prestigious award thanks to a score of 95.3/100. A result that is echoed in the fact that The Historical Vintage Ale 2016 won its first medal ever, a silver in the category Wood and Barrel Aged, for its limited edition, matured for over six months in barrels that had previously contained French Hine Cognac. 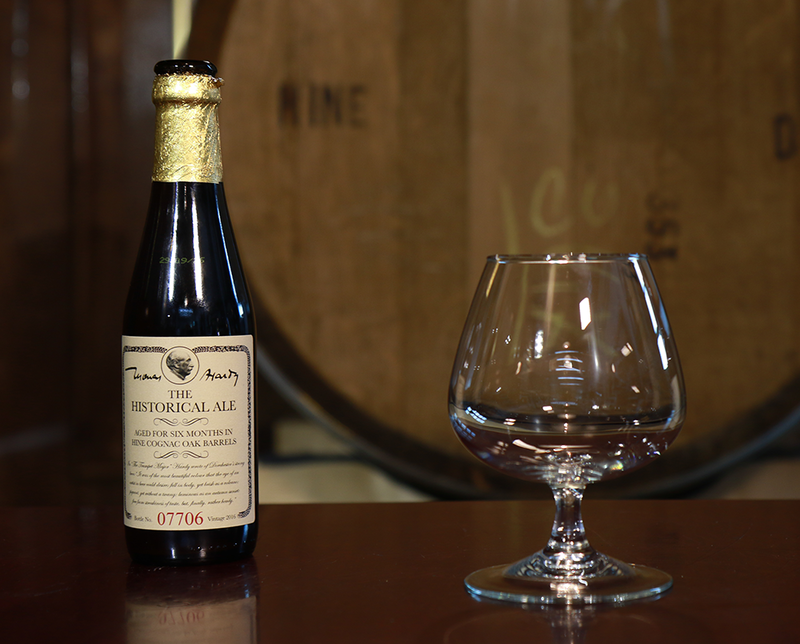 The Historical Ale, a version of the classic Barley Wine Thomas Hardy’s Ale, aged in Cognac barrels, has reached its first, very important goal: it has entered the prestigious Ratebeer.com TOP 50 list after glowing reviews from the international community. Last year the “renewed” Thomas Hardy’s Ale was recognised and awarded at the international World Beer Awards and International Beer Challenge competitions. 2017 promises to be another rewarding year for the Vecchiato brothers, who decided to revive the history of this classic English Barley Wine. This time, the most sought-after endorsement of all – that of the general public – was awarded to The Historical Ale, an extremely limited edition of the Thomas Hardy’s Ale, aged for over six months in barrels of French Hine Cognac. To be precise, this endorsement was given by many beer enthusiasts who come together on Ratebeer.com, a site that enables visitors to review and rate tasted beers. Reviews and ratings for The Historical Ale are nothing short of excellent, with a total score of 99/100. This means this English “treat” has made the “TOP 50 Barley Wine” list, alongside some of the best crafts in the world. Comments by site members speak of fruity and barley notes; aromas of toffee, dried and seasoned fruit and wood, while the Cognac takes centerstage. This beer is still very young and will no doubt improve by ageing a few more years in the canteen, but it has already met the approval of enthusiasts all over Europe, especially Scandinavians who are particularly active on Ratebeer.com in late spring. The “classic” Thomas Hardy’s Ale, whose aroma and structure is even better suited to mature with age, has also grown steadily reaching an exceptional average of 89/100. Thomas Hardy’s Ale’s new adventure got off to a promising start and can already be confident that its community has never forgotten it. Thirteen wooden barrels used for ageing Cognac of the finest quality made by the French company Hine have “hosted” a small quantity of Thomas Hardy’s Ale for over six months. A return to its origins to celebrate the rebirth of the quintessential English Barley Wine. A preview announcement had already been released but nobody knew the name or details or the date of the official release. It will happen on 20th November when the new Thomas Hardy’s The Historical Ale will be introduced to the public attending the HORECA Expo in Ghent, Belgium at HALL 6 – BOOTH 6126. A very limited edition of this specialty brewed to celebrate the return of Thomas Hardy’s Ale that was produced for the first time in 1968 as a ‘one-shot’ and aged in wooden barrels for the occasion. This time the Sherry barrels used in 1968 were replaced by Cognac barrels: thirteen 350-litre oak barrels arrived from Hine, the award-winning French distillery. Almost nine months in the barrels has made it possible for The Historical Ale – the name chosen to convey the return to the beer’s origins – to develop its aroma and flavour while incorporating the essence of the Cognac and wood, which blend to perfection with the silky body, malted sweetness and notes of chocolate and brandied fruit of the Barley Wine. A few thousand 25 cl bottles and a 12.7 ABV are the final technical features of a beer that is even rarer and more distinctive and could easily be left in the cellar to age in its bottles for many years to come. The prestigious World Beer Awards welcomed back Thomas Hardy’s Ale: the title of “Country Winner” in the Barley Wine style is proof that the 7-year interruption has not diminished this beer’s singularity – it’s “English” by vocation.  Thomas Hardy’s Ale is finally back in production and it has already added another seal to its rich, tormented and illustrious history. After the recent gold medal at the International Beer Challenge, the title of “United Kingdom Country Winner” awarded by the competition’s international jury to the Barley Wine as the best in the country is the confirmation that Thomas Hardy’s Ale is ready to pick up from where it left off. After all, the label changed ownership in 2003 (and with that, a change of location for its team of workers and production) when the American importer George Saxon and O’Hanlon’s Brewery decided to resurrect the beer dedicated to the English poet and novelist produced by the Eldridge Pope Brewery from 1968 to 1999. Unfortunately, Saxon also was forced to throw in the towel in 2008 due to the high production costs of a beer that requires supervision, production time and the quality of prime materials that are far superior to those needed for the classic Lager beers. But today there is a growing awareness on the part of public which is always on the lookout for quality, authentic stories and a flavour that goes beyond conventions. In this regard, Thomas Hardy’s Ale has admirers and collectors throughout the world thanks to its smooth yet complex body. The beer’s many subtle flavours make it difficult to describe in just a few words: notes of candied and brandied fruit, dried figs, fresh tobacco, chocolate, bitter orange marmalade, dried fruit and chestnut honey. Another reason why it’s so well loved is because it ages very well. 25 years in the cellar perfects its structure and refines its aroma.